When it comes to the choice of a university, many factors influence students’ decisions. Teaching and research quality and reputation of a university are significant contributors to its international and local appeal. Today different university rankings help students explore performance indicators of universities around the world without leaving their homes. That is why university’s inclusion into world university rankings is a sign of its recognition in the international academic and research environment. As a result of consistent and hard work, South Ural State University continuously improves its ranking positions in Russia and abroad. The University is building a strong international reputation and is becoming a fierce competitor in the education market. In 2018 South Ural State University was ranked among the world’s best universities by QS World University Rankings. This academic ranking is among the most influential university rankings in the world. Every year QS World University Rankings assess over 4 thousand universities around the world and publish a list of the best academic institutions. Published annually, QS World University Rankings by Subject helps prospective students identify the leaders in their chosen academic and research fields. South Ural State University is proud to be among the 27 Russian universities and the only university of the Chelyabinsk region ranked in QS WUR. 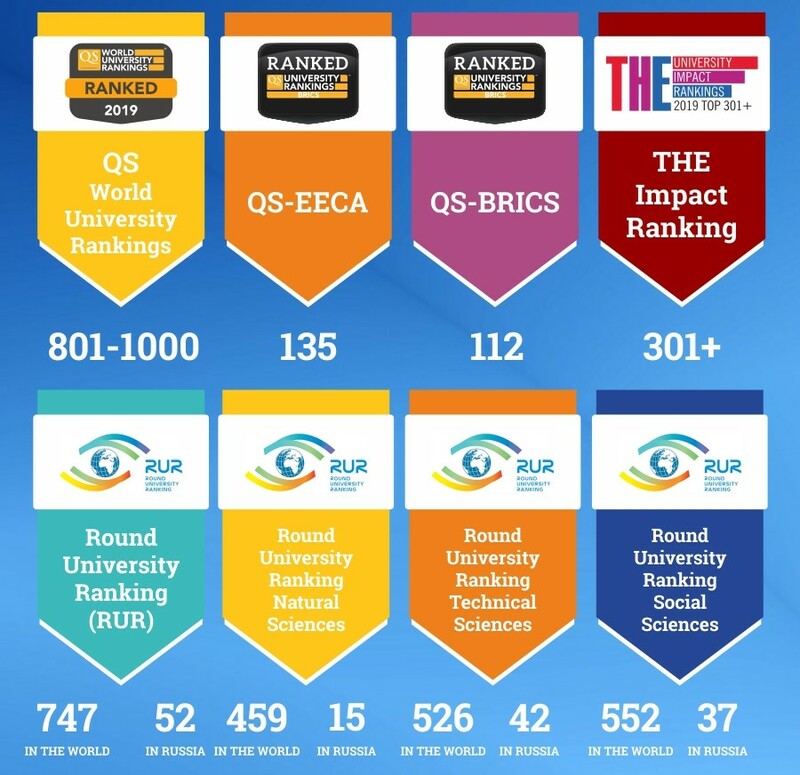 Ranked in QS World University Rankings, South Ural State University has also been recognised by QS EECA University Rankings (Eastern Europe & Central Asia), and QS BRICS University Rankings. In 2018, South Ural State University became one of the world’s leading universities according to RUR World University Rankings. RUR Technical Sciences World University Ranking specifically evaluates university courses in technology and engineering. The ranking examines 52 subjects such as Mechanical Engineering, Mining & Metallurgy, Nanoscience & Nanotechnology, etc. In 2018, South Ural State University was ranked among the world’s best universities for technology and engineering degrees. In 2018, South Ural State University improved its position in RankPro compared to the previous year. In 2018 South Ural State University visibly improved its position in Webometrics Ranking of World Universities. With uniRank University Ranking assessing over 13 000 universities worldwide, South Ural State University is more than 11 000 universities ahead! Expert Ra (RAEX) is the largest credit rating agency in Russia. Apart from debt ratings, the company regularly issues the ranking of Russian universities. The universities are ranked depending on the quantitative and qualitative indicators of academic and research performance and the universities’ employer reputation. South Ural State University is among the institutions officially recognised by Interfax university ranking. 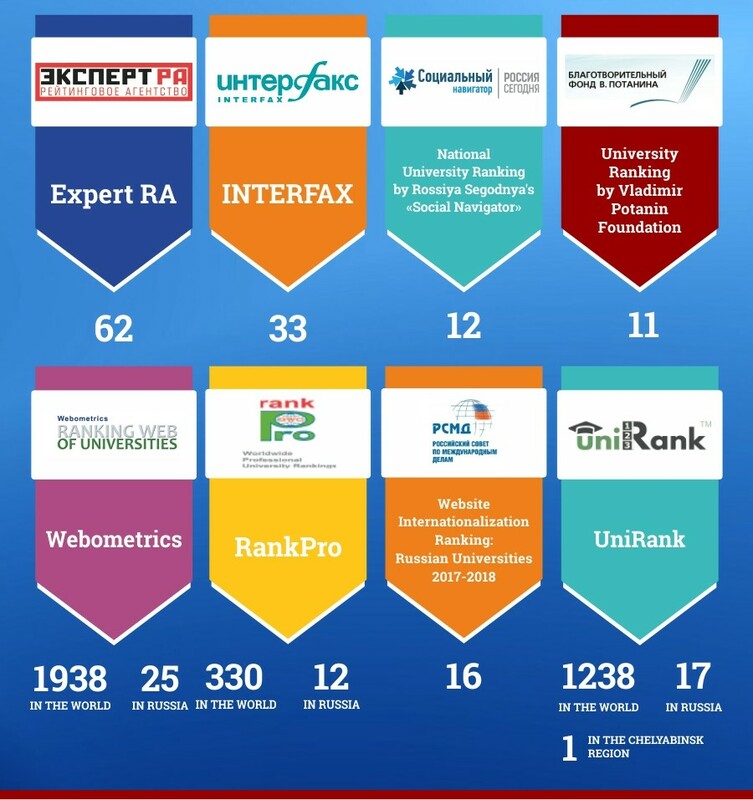 In 2018, the Russian International Affairs Council (RIAC) published their Website Internationalization Ranking. Analysis of 65 English-version websites of Russian universities revealed the country’s leading institutions in terms of their web presence and engagement. RIAC specialists examined the number of university web pages and their quality in English according to a set of criteria. South Ural State University is among the top 20 Russian universities for English-language website version.